For a long time nobody paid much attention to the question what an unborn baby might experience in the womb before birth. It was assumed that an infant has such limited cognitive abilities that it is like “a blank piece of paper” after it is born. This assumption even went so far that some denied preterms and newborns feeling pain and, for example, refused anaesthetics during surgery . Today we know that these assumptions were completely wrong. Additionally, research indicates that a newborn has already made considerable experiences, on the one hand from the external and internal environment  and on the other hand through the shared blood circle with its mother . A process also referred to as “prenatal programing” in the literature. Actually the fetal nervous system starts developing very early in pregnancy. The main subdivisions of the brain are, in a basic form, visible at five gestational weeks . At about gestational weeks 25-29 the fetus is then even able to hear internal (e.g. from the maternal gastrointestinal system) and external sounds . So obviously the fetus gets a vague idea from the external environment through its senses far before birth. Some studies even demonstrate that fetal heart rate patterns change distinctively depending on whether the unborn child is exposed to the maternal voice or another female voice [6, 7]. What these findings actually demonstrate are first signs of prenatal learning, namely the learning how the voice of the mother sounds as compared to other auditory stimuli. And how about perinatal memory? As mentioned above fetuses react differently to their mother’s voice already before birth. Another way of investigating memory very early in development is presenting an external stimulus (e.g. music or a nursery rhyme) repeatedly and over weeks to the unborn child and then test for recognition of these stimuli shortly after birth. Signs for recognition can be derived from changes in non-nutritive sucking rates, breathing rates or heart rate changes. Here, one then talks about “perinatal memory”, or memory “around birth”. Several studies have reported findings evidencing perinatal memory, usually using auditory stimulation and measuring behavioural reactions such as heart rate activity [2, 8]. Unfortunately, the validity of former research is often limited by the small sample sizes, and missing control groups but also by the fact that brain activity processing these stimuli are rarely assessed. To fill this gap, we are currently focusing on exploring perinatal memory and collecting newborns brain reactions to familiar and unfamiliar material. Rodkey, E. N., & Riddell, R. P. (2013). The infancy of infant pain research: the experimental origins of infant pain denial. The Journal of Pain, 14(4), 338-350. James, D.K. (2010). Fetal Learning: a Critical Review. Infant Behavior and Development, 19, 45-54. doi: 10.1002/icd.653. Jansson, T., & Powell, T. L. (2007). Role of the placenta in fetal programming: underlying mechanisms and potential interventional approaches. Clinical science, 113(1), 1-13. O’Rahilly, R., & Müller, F. (2008). Significant features in the early prenatal development of the human brain. Annals of Anatomy – Anatomischer Anzeiger, 190(2), 105–118. DOI: 10.1016/j.aanat.2008.01.001. Hall, J.W. (2000). Development of ear and hearing. Journal of Perinatology 20(8), 812-820. Kisilevsky, B., Hains, S., Lee, C., Xie, X., Huang, H., Ye, H., Zhang, K., & Wang, Z. (2003). Effects of experience on fetal voice recognition. Psychological Science, 14, 220–224. Kisilevsky, B., & Hains, M. (2011). Onset and maturation of fetal heart rate response to the mothers’ voice over late gestation. Development Science, 14(2), 214–223. Kisilevsky, B., & Hains, S. (2010). Exploring the relationship between fetal heart rate and cognition. Infant and Child Development, 19(1), 60–75. doi: 10.1002/icd.655. 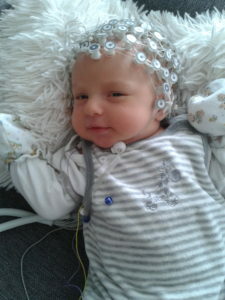 In our baby EEG lab we want to explore both, (i) the effects of the experience newborns make prenatally and (ii) the influence of the mother-child-relationship on the development of newborns cognition. Currently we are focusing on perinatal memory. Perinatal memory refers to the process of learning before birth and to measure overt signs of recognition of these stimuli after the baby is born. There is one specific stimulus that is frequently reported to be learned naturally by the fetus, namely the voice of their mother. According to former research, babies have shown clear preference for their mother’s voice over a stranger’s voice [1; 2]. Furthermore there are studies reporting newborns preference to prenatally presented material like music  or nursery rhymes . The challenge with research of this kind is, that it is of course not possible to “ask” a newborn for its preferences; consequently, usually behavioural reactions (like non-nutrional sucking rates, breathing rhythms or heart rate changes) are studied. As of course processing a stimulus (like hearing a familiar voice) is linked to neuronal processes, we are – in contrast to former studies – additionally interested in brain reactions to familiar and unfamiliar auditory stimuli. Last but not least we are exploring the interaction of early bonding between the mother and the child and the newborns cerebral response to salient auditory stimuli such as the voice of the mother. Pregnant woman are asked to tape a nursery rhyme and replay the taped rhyme two times daily from week 34 of gestation until birth. Within the first two weeks after birth, high density electroencephalography (hdEEG) is used to collect brain activity to the prenatally presented (familiar) rhyme which is either spoken by the mother’s voice or a female stranger. In addition we replay a new (unfamiliar) rhyme to the baby, which is likewise presented in both voices. The hdEEG recording is repeated at five weeks after birth and is completed with a short 5min video in which we record a mother-child interaction for the later assessment of maternal sensitivity and “early bonding”. DeCasper, A. J., & Fifer, W. P. (1980). Of human bonding. Newborns prefer their mothers’ voice. Science, 208, 1174–1176. Hepper, P. G., Scott, D., & Shahidullah, S. (1993). Newborn and fetal response to maternal voice. Journal of Reproductive and Infant Psychology, 11(3), 147–153. James, D.K., Spencer, C.J., & Stepsis, B. W. (2002). Fetal learning. A prospective randomized controlled study. Ultrasound Obstetics Gynecology, 20, 431–438. DeCasper A. J., & Spence, M. J. (1986). Prenatal Maternal Speech Influences Newborns’ Perception of Speech Sound. Infant Behavior and Development, 9, 133–150.